We're paying attention, so you don't have to. Here are a few of the most interesting things happening in the marketing world this week, courtesy of some of the top experts, thought leaders and CMOs in the industry. According to Ben Plomion, the VP of marketing for Chango, a growth hacker is a product and user-experience designer who specializes in getting products to market themselves. Many CMOs are now embracing growth hacking's engineering-focused approach to marketing, so Plomion provides three lessons on what CMOs can learn from it. One takeaway: data can and should be leveraged in real time. 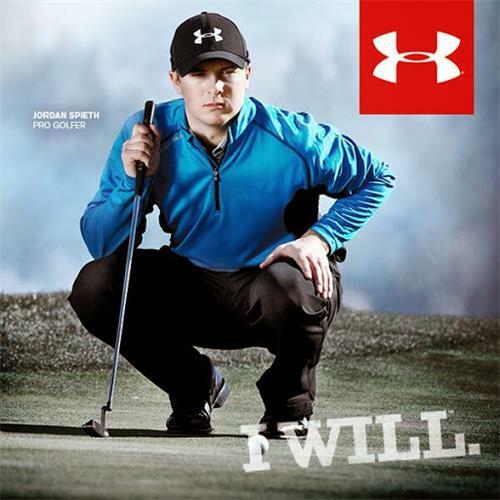 Athletic apparel company UnderArmour said last week that it will increase its ad budget by more than one-third in 2014. CEO Kevin Plank said he expected to divert 11% of his revenues to marketing, a total of $330 million. That's a 34% increase over last year. To put the big increase into a bit of perspective, however, consider that UA's overall marketing budget pales in comparison to that of rival Nike, which will spend over $2.7 billion in 2014. 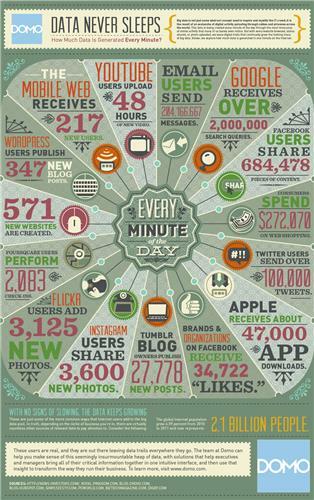 Ever wonder how much data is being loaded onto social media platforms every minute? Domo.com put together an infographic that charts the non-stop explosion of content. Among the findings: Google receives over 2,000,000 search queries per minute, Twitter users send over 100,000 tweets and Facebook hosts over 684,000 pieces of content. In an interview with CMO.com, Acquia CMO Tom Wentworth talked about the challenges of working for an open source company that provides software and services based on the Drupal content management system. He acknowledged the fear, uncertainty and doubt that often surrounds open source, but said the decision to join Acquia was a no-brainer. "As somebody's who's been in the market for so long, I saw the clear shift to open source and I saw the disruption Drupal was having in the market and really wanted to be a part of it. When I look at the future of integrated digital experiences and how I see CMOs are changing how they adapt digital technology, I think Drupal is so strongly suited for that and I had to find a way to get here." -- Tom Wentworth, Acquia CMO. Kimberly-Clarke is a Fortune 500 company that doesn't do advertising or digital marketing, according to its CMO, Clive Sirkin. In fact, Sirkin told Digiday that he banned the words "digital marketing" from his company's lexicon. All these terms get abused, he said. "We don’t do advertising. We talk about building brands in a digital world, but I’ve banned the word “digital marketing” too. We write briefs around business problems, and we ask agencies to come to us with business ideas. We don’t look at a script for an ad or a billboard. We want to figure out what is preventing consumers from buying more or doing more. That changes fundamentally how you get your marketers and agencies to think about ideas, because generally they are trained to think in terms of executions, in terms of a TV ad. The worst term ever created is 360 marketing." -- Clive Sirkin, Kimberly-Clarke CMO. Scribble Tip: According to a 2012 study by ROI Research, people are more likely to engage with a brand or product on social media if there is a picture posted with it. So catering to the visual nature of your audience will make your content more appealing. Try adding photos, videos, block quotes, graphics and tweets whenever possible. Learn how ScribbleLive can help you create engaging content.